Barnes Wallis came to the public’s attention with the release of The Dam Busters, the 1955 film that illustrated the success of bouncing bombs in the destruction of German dams in 1943, and the heroism of the men of 617 Squadron. Little else was generally known about the enormous contribution Wallis made to the development of airships, aircraft, and specialist weapons. 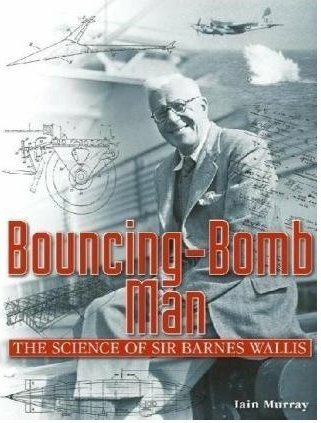 Bouncing Bomb Man has corrected this, and it will become the definitive work detailing Wallis’ unique contribution to weapon design and aviation. Born in 1887, Wallis’ early education was unremarkable. He was indentured as an engineering apprentice working bombs should contain as much explosive as possible, since the amount of disruption was proportional to the cube of the charge weight. Thus, the literally groundbreaking idea of the earthquake bomb was conceived. Initially, these ideas were deployed in the novel ‘bouncing bombs’. These spinning bombs were dropped at very low altitude, bounced across the water, avoiding anti-torpedo nets, and then rolled down the faces of the dam or beneath ships before detonating and destroying the target by pressure waves. The success of the bouncing bomb in the destruction of the Mohne and Eder dams, and the severe damage inflicted on the Sorpe dam, cleared the way for Wallis, ‘the RAF’s number one wizard’, to develop the massive Tallboy and Grand Slam earthquake bombs. These precision engineered weapons, fabricated from special steel and containing up to ten tonnes of explosive, hit the ground at supersonic speeds and could penetrate 10m into the earth before detonating. They were successfully used against the Tirpitz, the Beilefeld viaduct, U-boat pens, and other German targets, including V1, V2, and the little known V3 rocket installations. After the war, Wallis was engaged in the design of variable geometry aircraft and other advanced designs, including the ill-fated TSR2. Designs for hypersonic and sub-orbital aircraft and a revolutionary concept design for a high-pressure submarine were to follow. Haunted by the death of 53 aircrew in the ‘dam buster’ raids, he vowed never again to endanger the life of pilots, and much of his later aircraft work was hindered by his wish to replace test-pilots with radio control equipment. He also produced designs for bridges, smokelaying gliders, and incorporated similar geodetic designs to those used in the R100 airship and the Wellington bomber into the dish of the Australian Parkes radio telescope, also designing the equatorial mount that enabled it to be steered. Wallis continued working long after his enforced retirement at the age of 83. Characteristically, he derived a formula for calculating the date of his demise; underestimating this by two years, he died in 1979. His fame lives on via The Dam Busters film, but this book is broader testament to a genius whose inventions demonstrated original thought and a vision for the future of aviation. This large, well presented book is printed on high quality paper and contains over 130 illustrations and numerous tables. The six appendices provide additional information that compliments the text, and the many pages of notes and sources will please scholars and researchers.